One of longest family tenancies on Berkeley Square was that of Russell McDonnell Taylor, who built #11 on Lot 8 in 1911. 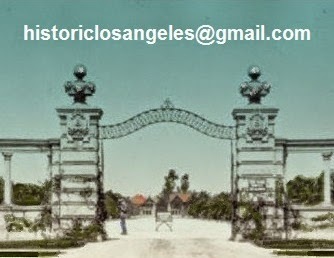 While some sources, including Sam Watters in his excellent Houses of Los Angeles 1885-1919, cite Myron Hunt and Elmer Grey as architects of the house, a 1912 biography states that, following the dissolution of his partnership with Grey, Hunt erected #11 "from his own designs." The Los Angeles Times issues of April 6 and July 12, 1911, likewise mention Hunt as the sole architect. 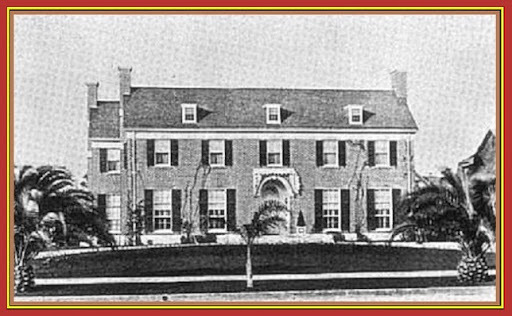 Although the brick Georgian Colonial style of the house was one common on the East Coast by the 1910s, it was rather new for Los Angeles, and certainly was to be a rare style for the Square. The main street façade was traditionally symmetrical, while the back was an L-shape distinguished by a double gallery reminiscent of Charleston. The 14-room house was nearing completion in the summer of 1911. Russell Taylor had been born in Chatham, Ontario, Canada, in 1876, coming to Los Angeles with his family at age 7. His father, Joseph M. Taylor, soon acquired large tracts in the Southland and went into the land brokerage business. It seems that Russell's formal education ended after his graduation from Los Angeles High School in 1896; at some point he followed his father into real estate, with his offices on the same property at Grand Avenue and 6th Street downtown where he had lived with his parents as a child in what was then a residential neighborhood. He was variously treasurer of the Columbia Trust Company, a director of the Crags Land Company, and he later became an insurance executive. His club memberships were predictable and included the California, the Santa Monica Beach Club, as well as the L.A., Crags, and Midwick country clubs. 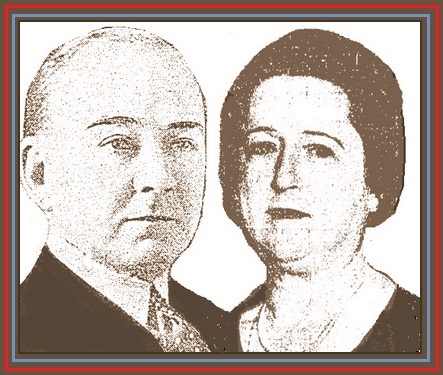 In April 1909 he married Virginia Clarke Keely, the widow of a Philadelphia physician, with whom she had had a son, Charles Clarke Keely, born on Christmas Eve 1902. Taylor appears to have moved from his father's house on Pleasant Avenue in Boyle Heights to Adams Street with his new wife and stepson for the few years before #11 was built. Mrs. Taylor seems to have busied herself over the years by giving endless teas and luncheons at home, which, were they her only distractions, might explain her sad end. But the Taylors were an adventurous couple. They traveled to Europe in the summer of 1913. In 1924 they went east by rail to retrieve their son after his sophomore year at Yale, motoring—our grandmother once spoke of motoring—circuitously all the way back across the country at a time before numbered highways, or even much in the way of highways at all, especially out west. The nearly six-week trip took them from New Haven to Chicago, Colorado Springs, on up to Yellowstone and Glacier parks, over to Seattle. Then it was down to Portland, San Francisco, and Santa Barbara before the old Franklin collapsed in a heap in the garage of #11 Berkeley Square. Not so the Taylors. Showing the great social fortitude characteristic of the Square, a week after their return to Los Angeles they threw a big dinner dance for their son and his friends at the Santa Monica Beach Club. Among the other Berkeley Square sheiks and shebas attending were Catherine Cheney of #15 and the sisters Gray—Mary, Dorothy, and Margaret—of #1. His recent 6,000 miles on the road still weren't enough for young Clarke. Before long he took off with two college buddies in the overhauled phaeton for points north, including a stay at Mammoth Lakes in the High Sierra, where the family would build a retreat a few years later. After earning his engineering degree from M.I.T. and once he hit 30, the pressure on Clarke to marry likely intensified lest he follow the wild ways of some of his neighborhood chums or, conversely, lest he become too boring hunched over the drafting table. Soon enough he was engaged to proper Junior Leaguer Beatrice Louise Sargeant of Denver. The wedding took place in Colorado on June 30, 1933; after the honeymoon, the young Keelys moved into 2404 6th Avenue, near the Square in the traditional starter-house neighborhood for young social Los Angeles couples. Clarke Junior was born in short order the following April 6. A few months later the new grandparents took off on a South Seas cruise, returning in July to host a Christening party for the baby on the 28th. Sadly, travel, a grandchild, and constant parties all seem not to have given Virginia Taylor much cheer. 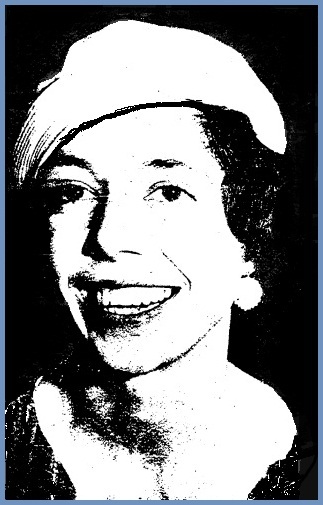 At 5 p.m. on April 28, 1935, with her husband in the next room at #11, the 56-year-old Mrs. Taylor shot herself in the head with a .32-caliber revolver. Three surgeons working into the next morning couldn't save her. The Times cited unspecified illness and prolonged insomnia as motives. Virginia herself gave an explanation in a note to her husband and son, referring to having suffered with sleeplessness for 25 years. Last rites of the Episcopal church were conducted at home, with burial in nearby Rosedale Cemetery. This sad turn of events was compounded for the young Keelys when Russell, age 59, died at St. Vincent's Hospital on July 21 the next year after suffering a stroke at #11. Clarke Keely was at his stepfather's side—for all intents and purposes, his father's—when he died. The Keelys had in the meantime moved from 6th Avenue to Lafayette Square, still within the confines of West Adams; by 1938 Clarke was back in his boyhood home and his family became the next generation to live at #11. Clarke was chosen by Mayor Fletcher Bowron to serve on the Water and Power Commission in 1941; his own engineering offices at the time were still at 650 South Grand, on the spot his grandfather Joseph M. Taylor had lived in the 1880s. Life was calmer for the Keelys after the mid-1930s as they witnessed a continuously changing Los Angeles from the Square; they held on at #11 until after 1956, Beatrice following Square tradition in volunteer work, including support of Children's Hospital. 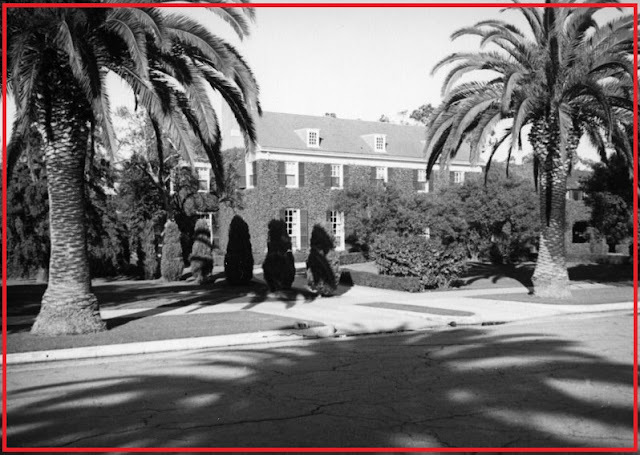 By 1960 the Keelys had moved to 100 South Hudson Place, hard by the Wilshire Country Club, a brick Colonial house still standing and remarkably like #11 Berkeley Square. Beatrice died at 64 in 1974, Clarke Sr. at 87 in 1990. The Keely's second son Russell David, named after his grandfather, still owns the house two doors away from his grandparents' old South Hudson Place address, giving us a family with—so far—128 years in Los Angeles. Who says the city has no history? A George T. Wigmore is listed as living at 11 Berkeley Square in 1960, after which, as far as Los Angeles city directories are concerned, the house and its human history have vanished.